Over on XDA-Developers a picture was posted showing a poster of the HTC Mozart running Windows Phone 7 and coming in October this year. The picture, larger below, is actually a badly photoshopped HTC Desire with Windows Phone 7 kind of stretched partly over the screen. However, the poster is real and seems to confirm that the HTC Mozart with WP7 is landing in a few months time. Conflipper also chipped in on the thread by saying the HTC Mozart does exist and that it is coming to T-Mobile in the US as well as Telstra. 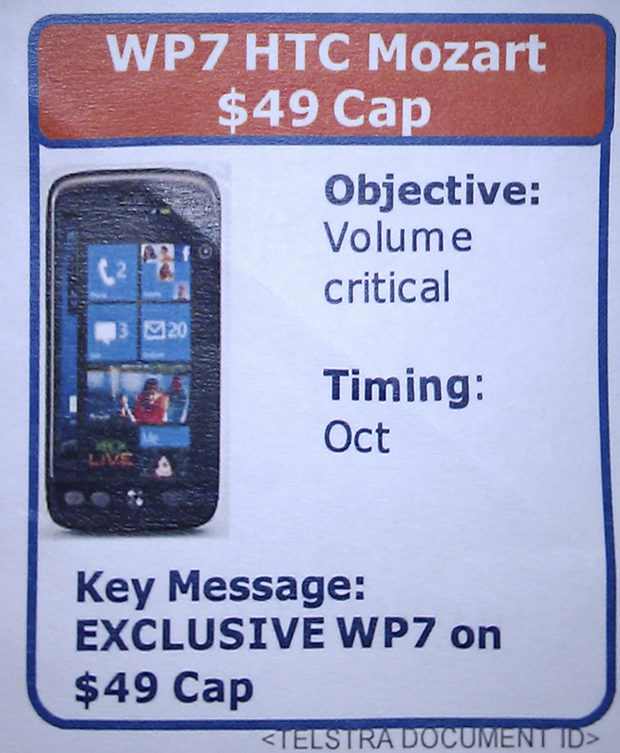 So, it is unclear why a bad photo shopped image would be used on a poster or magazine, but we are inclined to believe that a cheaper budget device could have WP7 by October and even more so after Conflipper mentioned a few things on that thread too. We’ll get more details when they arrive. Cant u all see its a HTC desire phone with a badly photoshop image of windows 7.. check the image carefully u will see the android image on the left side of the screen.. the win7 image is photoshoped on it.. its a joke.. some one is making a joke out of it..